Mitt Romney. . . spotted something he thought did not belong at a school where the boys wore ties and carried briefcases. 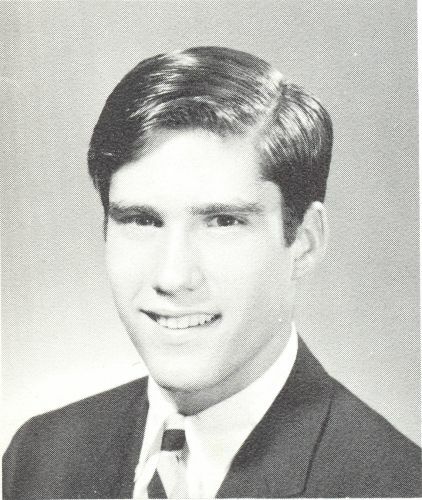 John Lauber, a soft-spoken new student one year behind Romney, was perpetually teased for his nonconformity and presumed homosexuality. Now he was walking around the all-boys school with bleached-blond hair that draped over one eye, and Romney wasn’t having it. For me — and I’d venture to guess I’m not the only one — the above account of Mitt Romney attacking John Lauber brings back painful memories of the anti-gay bullying I endured when I was in school. My stomach tightened into knots as I read it. Perhaps, though, it was an isolated incident — right? Wrong. In an English class, Gary Hummel, who was a closeted gay student at the time, recalled that his efforts to speak out in class were punctuated with Romney shouting, “Atta girl!” In the culture of that time and place, that was not entirely out of the norm. Hummel recalled some teachers using similar language. According to Romney and his campaign, the candidate has no recollection of either incident. But Hummel never forgot the way Mitt Romney teased him for his failure to conform to the gender and sexuality norms of the time. And neither did John Lauber — one of his former bullies, David Seed, ran into Lauber in an airport in the mid-1990s and approached him, apologizing for his role in what happened all those years ago. Lauber told him that the attack was “horrible” and recounted how frightened he felt as it took place, then acknowledged, “It’s something I have thought about a lot since then.” We’ll never know whether those scars ever fully healed for John Lauber — he died in 2004. As for Mitt Romney himself, the most he could muster was a qualified apology — not for anti-gay bullying, but for unnamed high school “hijinks and pranks.” He declined to comment on the accuracy of his former classmates’ allegations, although he did offer a sort of half-hearted, ho-hum defense, telling FOX radio host Brian Kilmeade that “I certainly don’t believe that I thought the fellow was homosexual. That was the furthest thing from our minds back in the 1960s.” So to hear Mitt Romney tell it, while his memory is completely blank with regard to that specific gay-bashing incident, he does know with absolute certainty that the attack — which again, according to him, may or may not have even happened — was in no way motivated by John Lauber’s real or perceived sexual orientation. It couldn’t possibly have been — after all, Mitt’s mind was completely unsullied by icky things like homosexuality in those halcyon days. Right. This story disturbs me on a level that goes far deeper than the political. In fact, it isn’t political at all. I find it troubling for the same reason that I was so bothered by the now-infamous story about Romney driving to Canada with a crated Irish setter strapped to the roof of his car: you can tell a lot about the content of a person’s character by how he or she treats the vulnerable. In the case of Seamus the dog, Romney a.) thought, unbelievably, that it was appropriate and/or humane to strap a dog to the roof of a moving vehicle and b.) was so wedded to his rigid itinerary of predetermined rest stops that he sprayed the dog down with a hose in a gas station parking lot after the understandably terrified canine wet itself at an inconvenient time. In the case of Gary Hummel, Romney had no compunction about publicly humiliating a closeted gay man. And then there’s John Lauber. The attack he endured scarred him for the remainder of his life and haunts its participants nearly half a century later, but Romney? You know, the “prankster” who pinned a gay man down and came at him with scissors as he screamed for help because he didn’t like the way he styled his hair? He claims not to remember that it even happened at all. Horowitz notes that the Romney presidential campaign has taken to citing the candidate’s youthful antics as a way to counteract the public’s perception of him as wooden, detached, and aloof. Romney’s wife, Ann — whom he met while in prep school — recently said of her husband that “there’s a wild and crazy man inside of there just waiting to come out.” I, for one, hope it doesn’t. With these disturbing accounts of anti-gay bullying on the part of Mitt Romney and his seemingly indifferent response, I’ve already seen more of that wild and crazy man than I ever wanted to.